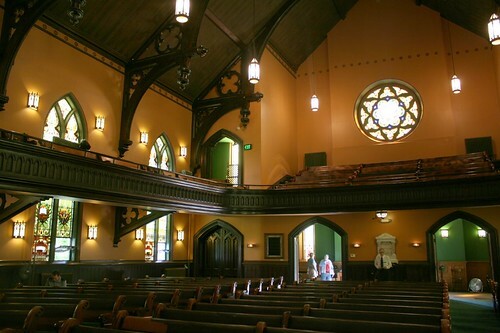 Lake Street Church is Evanston’s oldest (designed 1872 by architect Cass Chapman) and, for my money, the most beautiful. 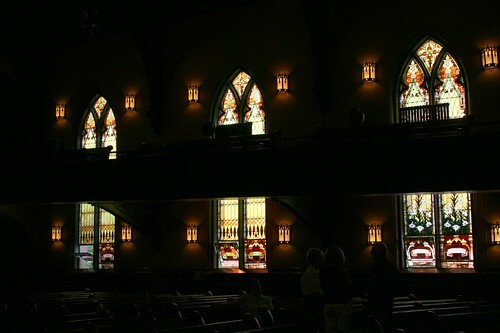 It’s Victorian Gothic – tall, narrow windows with pointed arches, and a general sense of verticality. The exterior is a simple affair of plaster (not original; when opened, the building’s brick walls were exposed), with only a few bits of ornament emerging at the corners. The simplicity without anticipates the elegance within. 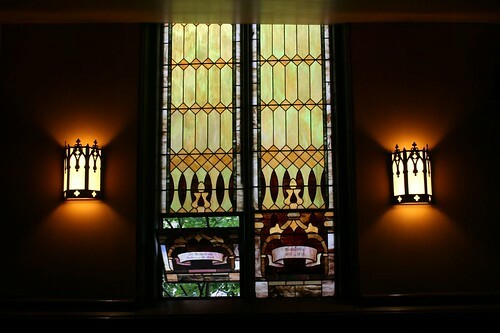 The sanctuary is a space defined by dark wood and stained glass in the earth-hued range of tones that inspired both the Prairie and Arts and Crafts movements. The head usher shared a couple of other interesting tales. 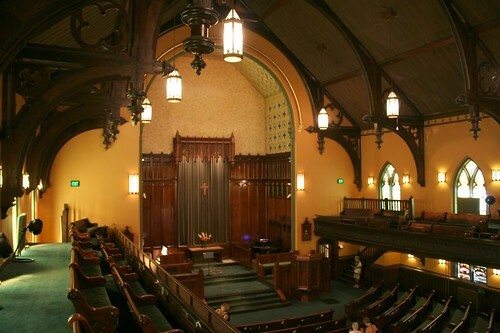 This was the church of Jimmy Carter’s daughter, so the President and his wife would occasionally attend services. This would bring the Secret Service pouring in, of course. 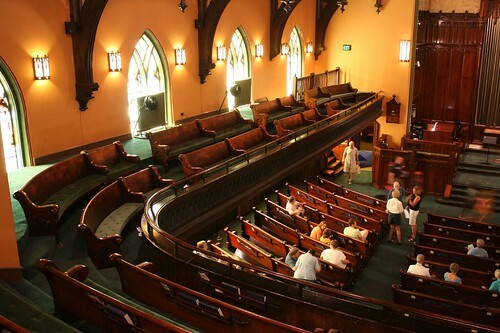 Being a community church, most of the congregation was recognizable by face to its ushers. A stranger in the gallery turned out to be one of the agents. 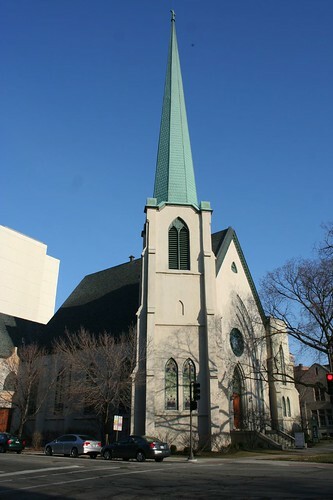 Lake Street Church was originally the First Baptist Society of Evanston, organized in 1858. 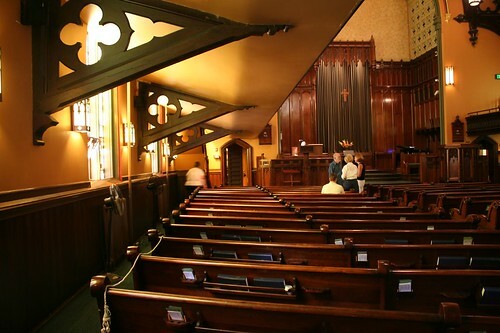 Today the church is the oldest public building in Evanston, and an officially designated city landmark. A later addition forms a courtyard space north of the sanctuary, and contains offices and meeting rooms. The stone Gothic design works well enough with the older building, but lacks its powerful and charming Victorian verticality. 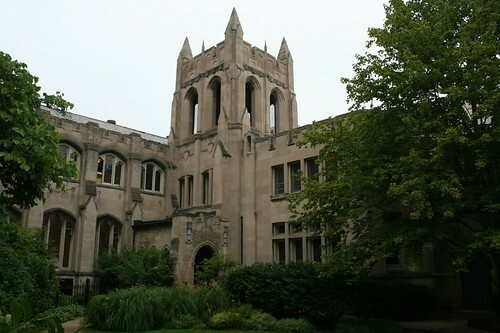 This entry was posted in Evanston, historicist churches, Victorian architecture. Bookmark the permalink. 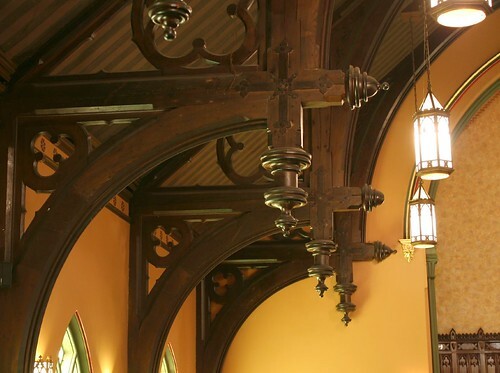 As a (now longtime) NU graduate student, I really love your explorations and analyses of the North Shore and Far North side.Beautiful photographs of this church and my favorite NU building: the NU church at Chicago/Sheridan. 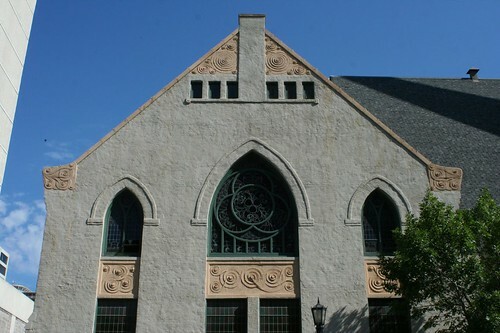 The Celtic-Jugendstil ornament is fantastic. I should pay more attention next time I'm up there. I think your usher misremembered. One of President Carter's sons lived in Evanston for several years, but not his only daughter, Amy.Thanks for the lovely pictures. Some of us know this church because it hosts the local AA Group and has several meetings a week there. It's a true servant of the community. 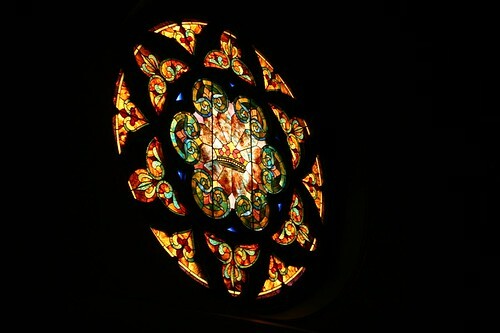 You have captured the sights as well as the atmosphere that I enjoy every Sunday as I attend Lake Street Church. How can I obtain both the photos and your excellent narrative? The connection to Carter is that the minister married a woman who was previously married to one of Jimmy Carter's sons. 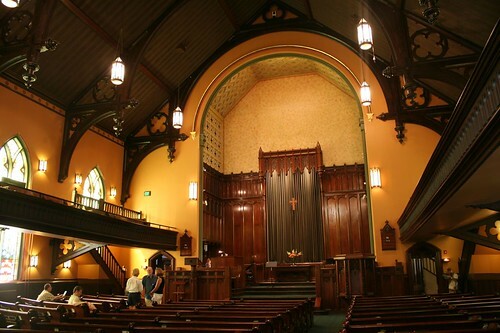 I loved seeing the interior of my church where I spent every Sunday since birth for about twenty years. I miss it and now must venture back after being reminded of its beauty.